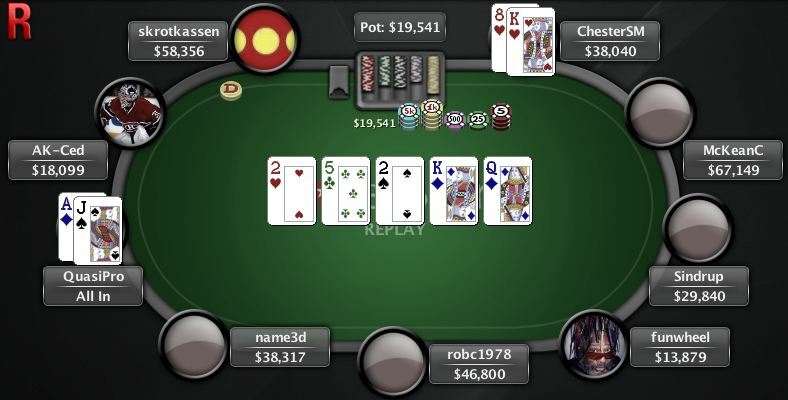 The Red Spade Open is one of my favourite tournaments to play on PokerStars. Outside of the minimum $1 million dollar prize pool with $200,000 guaranteed first place prize, there is also a chance to get a bounty knock-out on any of the PokerStar’s Team Online or Team Pro members worth an extra $100. It’s apparent I’m not the only one who enjoys this massive $50+$5 buy-in tournament as the total entrants reached 24,736. That meant the prize pool inflated past its’ guarantee to make it a total of $1,236,800 up for grabs! The first two hours for me were dreadful but I did make some great lay-downs that prevented me from going out early. 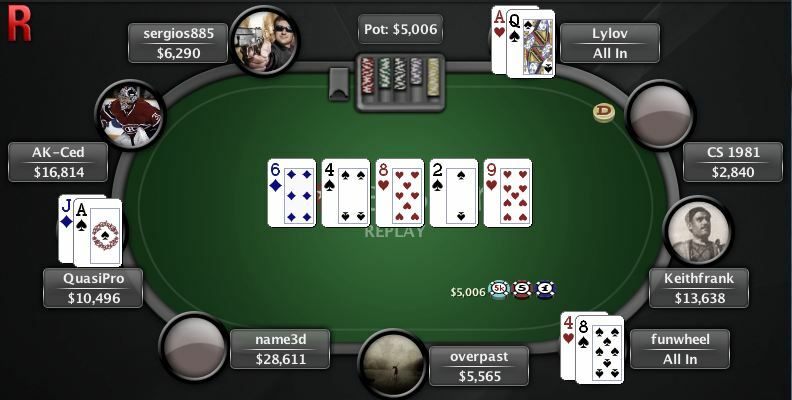 One example, in particular, was when I turned a straight but folded to a player who made an all-in raise – who ended up having a higher straight. I did go all-in twice before the second break, but both times resulted in split pots that left me with well under average chips. Shortly after the break, I picked up [AH] with [QC] and made my move. As the picture below illustrates, it was a coin-flip and luckily he did not have a spade. The new found chips was a blessing but then I ran through a long series of cold cards. 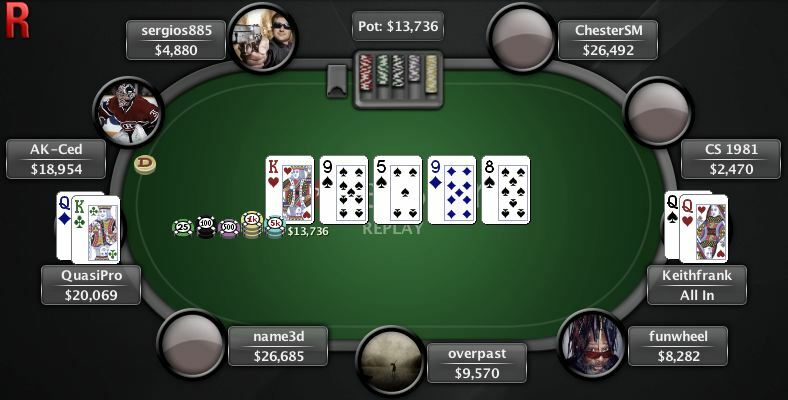 As I was once again getting closer to 10 big blinds remaining, I decided to make a stand with [7S] and [8S]. 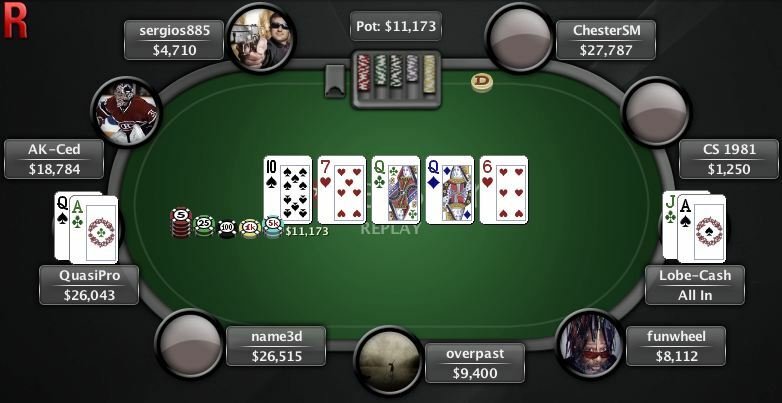 Although I got called by pocket nines, I managed to hit runner-runner flush to get a much needed double-up. Thankfully, lady luck was by my side when I most needed it. Not very long after that hand, a short stack pushed all-in after UTG made a minimum raise. 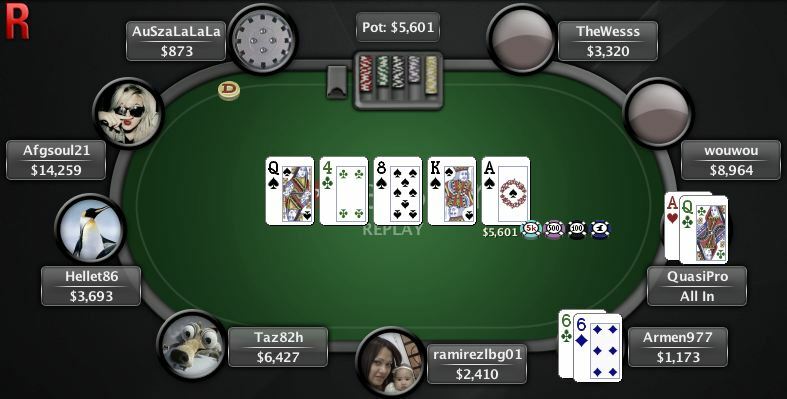 I drew pocket jacks and tried to isolate by 4-betting all-in and wasn’t happy to see the call. My opponents had [KS] with [10H] and [AC] with [QH] – I was hoping to be at worst a coin-flip, but despite still being a favourite, I had more outs to dodge. Thankfully, as the picture shows, it was a board of blanks and my hand held up. Just a few hands later, I raised another small stack with [AC], [QS]. His response was to 3-bet all-in but since it was only just slightly more than twice my raise, I could make the call. 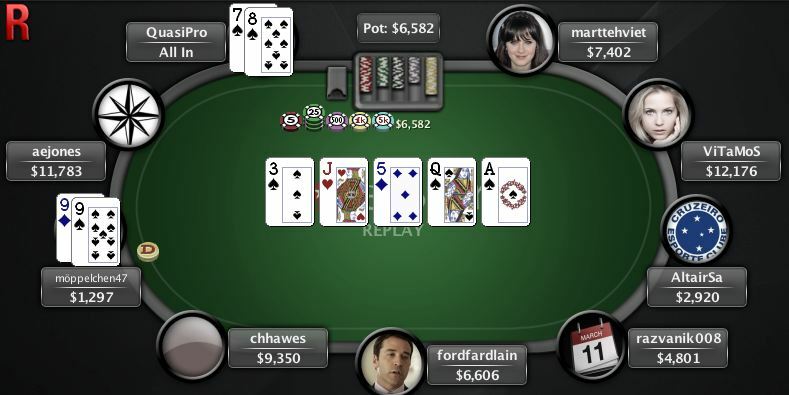 He showed [AS] with [JQ] and although I got the go-ahead pair on the flop, he also picked up a gut shot straight draw. I turned trips and the river was a blank putting me at just above average chips with 3590 players remaining. Sadly, that would be the end of my luck for the tournament. I couldn’t get anything going my way and was dealt very few playable hands. I did manage to make the money, but with the payout structure being very top heavy, you need a lot of chips to go deep. Eventually, I made a stand with [AD], [JS] in late position. 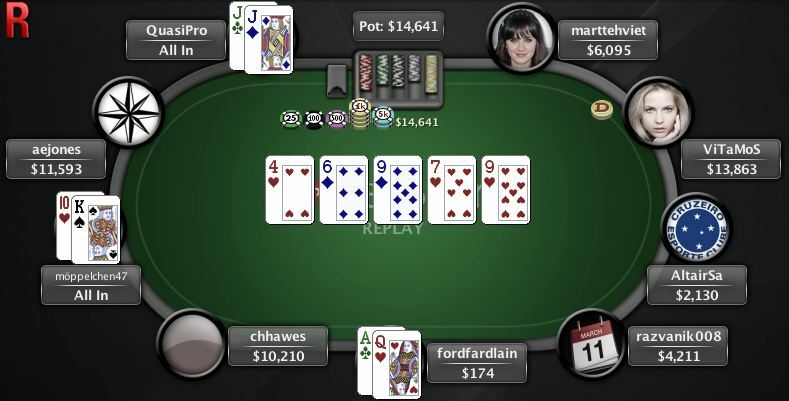 Although I was ahead going into the flop, disaster struck on the turn and I couldn’t get my miracle ace on the river, like you always see on TV. So in the end, I more than doubled my buy-in with a cash of $136.04. Though it’s hardly the $200,000 I daydreamed about, it’s a step in the right direction and there will be many more chances in my future to obtain that lofty goal.